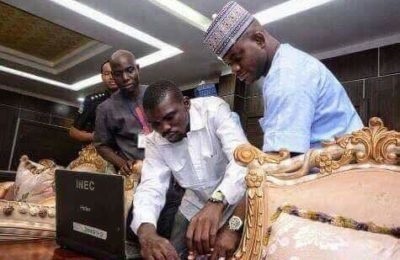 Kogi State Governor Yahaya Bello’s name has disappeared from the voters register after being accused of double registration. The Independent National Electoral Commission alleged that the governor first registered in Abuja in January 2011 and re-registered on May 23, 2017 at the Government House, Lokoja. INEC’s National Commissioner and chairman, Information and Voter Education Committee (IVEC), Solomon Soyebi, first raised the alarm over the governor’s alleged double registration. He said: “It has come to the attention of INEC that Governor Bello of Kogi State registered as a voter for the second time on Tuesday May 23, 2017 in Government House, Lokoja, the state capital. ”His first registration was on January 30, 2011 in Wuse Zone 4, Abuja. ”The governor’s double registration and doing so outside lNEC’s designated centres are both illegal. The governor has however, denied INEC’s claim, saying his ghost might have been registered by INEC because he was away in Dubai when he was said to have registered again. Speaking after praying at the Presidential Villa mosque on Friday, Bello said: “I traveled on 19th to Dubai for a brief break and I saw the press release and I was taken aback, that I did double registration on 23rd. But as INEC tried to ascertain the true position of the governor’s registration status, a fresh problem has cropped up. It was gathered that although the commission had the photograph of the governor’s registration, it could not trace any Yahaya Bello on its CVR list for May 23, 2017. There was suspicion that the list of voters registered on May 23 might have been tampered with by some INEC employees.